Color grading is an essential tool for making impressions, telling stories, and evoking responses from your video viewers. ColorDirector offers creative video-makers of all skill levels, the means to dramatically improve their projects through use of tools to control color and lighting. Change the look of your entire clip with adjustable Global Tone Level presets, or make precise color adjustments to selected parts of video footage with regional adjustment tools. 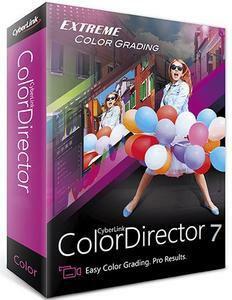 Import and export Look-up Tables (LUTs) for professional color grading control. Match footage from one source to another in order to achieve a particular effect throughout a video. Intelligent motion tracking algorithm makes frame-by-frame object tracking a breeze. Precision selection tools, now including Bezier Curve, let you select, isolate and track multiple objects through your footage. With ColorDirector you can import, preview, edit and export 360-degree video footage. Cutting edge technology accurately works with 360º video so that your edits are maintained throughout the entirety of your footage. To cut down on your 360º video editing time. Use PowerDirector to edit your raw video footage, launch ColorDirector directly from PowerDirector's interface for color grading, then send the footage back to PowerDirector for video rendering and production. Noise Reduction reduces extraneous visible artifacts including luminance (grain) and color noise, that degrade video quality. Create remarkably clear videos by effortlessly removing fog or haze from your shots with the intuitive Dehaze slider. ColorDirector comes with a range of built-in, professionally designed presets that emulate the styles of well-known films. You can also save any manual adjustments you make to a video as a preset and use it again on future projects. Take more control when color grading your projects, even when you use one of our pre-made templates. Control the intensity of each effect with as much granularity as you desire, with keyframe editing support. Quickly add drama and focus to your videos by turning them to black and white while retaining selected parts of the clip in color. A great way to draw the viewers eye and create memorable videos. Completely change the look of objects in your video with Color Shift. Sliding the Color Wheel lets you remap the colors in your video to give it an entirely different feel. It's now easier to perform professional color grading on your action camera videos with support to import 120/240fps slow motion footage from your iPhone, GoPro or other popular action sports cameras.